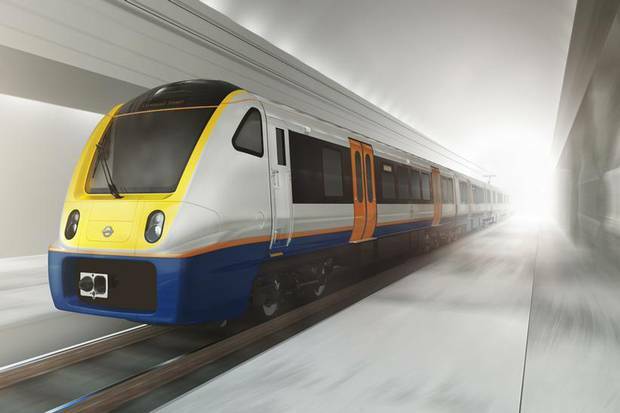 This picture gives a sneak preview of London Overground's new £5.7 million trains due to launch on routes across north-east London from 2018. Bombardier's four-carriage Aventra trains will replace the crumbling 1980s stock on services from Liverpool Street to Chingford, Cheshunt and Enfield, as well as the Barking to Gospel Oak line and the Romford to Upminster service. German-headquartered rail equipment firm Bombardier will be paid £260 million to build the 45 trains - which will include walk-through carriages, air-con and better disabled access. Mayor of London Boris Johnson said: "This brand new fleet of trains will enable London Overground to carry a growing number of passengers more reliably and speedily than ever." The Liverpool Street lines became part of London Overground in May, since when the operator has been plagued by complaints about delays and cancellations. Last month TfL's director of London Overground Mike Stubbs said disruption was "primarily caused by reliability issues with the trains we inherited on the route" and pledged £2m to improve the existing trains until their replacement in three years. "The trains TfL inherited are more than 30 years old and are not in good condition," he admitted. "The condition of the trains has been causing some delays". The new trains will be built in Derby and are expected to share their basic design with the forthcoming Crossrail trains. Interior images for the new service are expected to be unveiled at a showcase event in October. The Gospel Oak to Barking line will be electrified the year before the new fleet is rolled out.